We decided to take a short trip to Cambodia and cover all the 'must see' tourist attractions, including Angkor Wat, Security Prison 21, Choeung Ek (Killing Fields), Silver Pagoda, and many other temples. 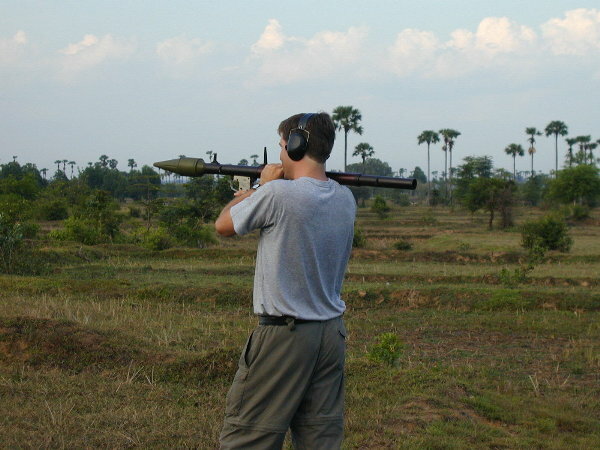 We had also heard that you can shoot some heavy artillery in Cambodia so we thought we might give that a try. We spent one day in Phnom Penh, the capital of Cambodia, visiting the Khmer Rouge genocide-related attractions from the 1970's, and visiting the shooting range. 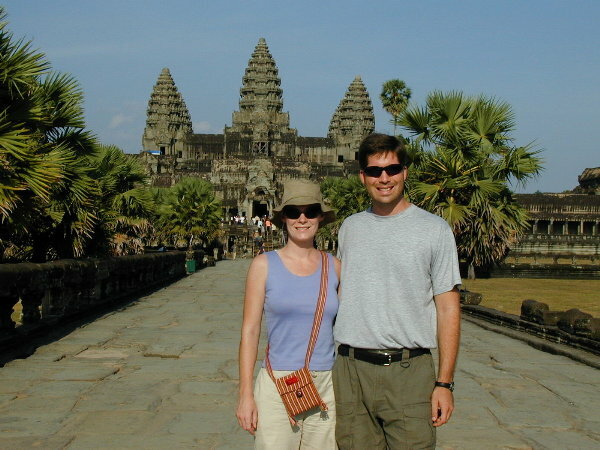 Then we flew to Siem Reap to see Angkor Wat and many, many other temples/ruins. The extremely hot humid weather made the touring somewhat painful, but overall we enjoyed Cambodia, though the Khmer Rouge experience was somewhat sobering. We did not know that much about places to visit in Cambodia, except what we had read in our travel books the week before in Bangkok. Because we only had time to see the 'must see' spots, we were happy to arrange a package tour for our time there. We quickly realized (and remembered) that Cambodia is a war-torn country, with millions of landmines waiting for victims, but is seemingly recovered from its most recent disaster of the Khmer Rouge genocide in the 1970's. Even with this terrible history the people of Cambodia were friendly, and the country welcomed tourists. We first flew to Phnom Penh, the capital of Cambodia, and visited the Silver Pagoda and neighboring Royal Palace. Since diplomats were working in the palace so we could not get in -- not sure we missed much, though. The Silver Pagoda is a temple that has a sliver plated floor, and serves as the private temple for the King when he is in town. We spent a bit too much time (45 minutes) on the grounds of the pagoda given what little there was to see. Although we remembered hearing about the child rebels in Cambodia in the 1970's neither of us had remembered the details. 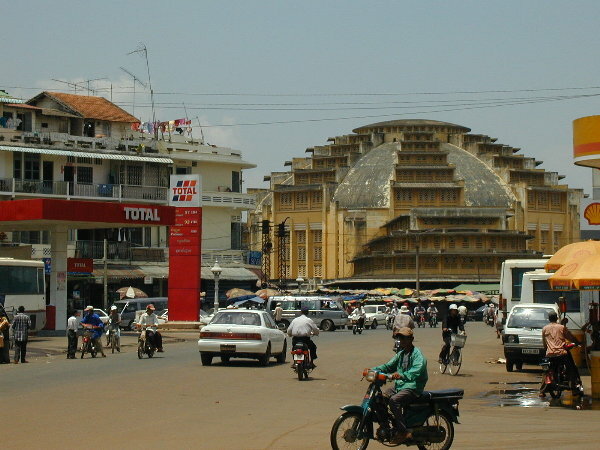 In 1975, Pol Pot's Khmer Rouge communist rebels stormed into Phnom Penh and began killing all government workers, professionals, teachers, police, intellectuals, and destroying all existing infrastructure. His goal was to return Cambodia to an agrarian society. 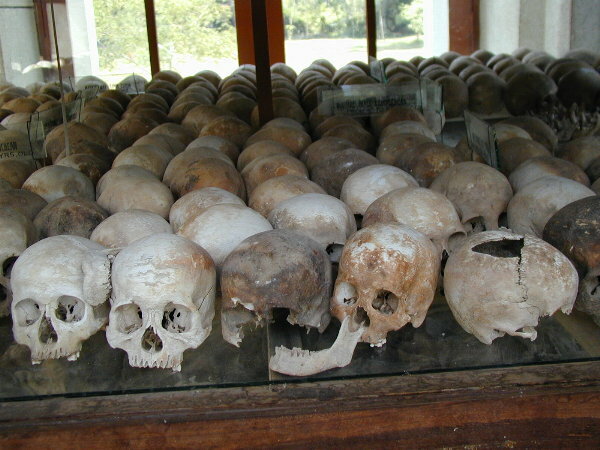 Pol Pot recruited and trained children as soldiers and they killed their parents and families in the process. He set up prisons as detention centers and torture areas before sending the people to the killing fields. It is believed that Pol Pot was responsible for killing between 1-2 million Cambodians during his four year reign. Some of the information we read stated that the US supported Pol Pot as the lesser of two evils -- although he was communist, he was not expansionist and only killed those within his own country. We visited the museum of former Security Prison 21, known as S21 to the Khmer Rouge 1975-79. This place was a holding and torture center for prisoners on their way to Choeung Ek, the most famous of the killing fields. The building was a school before Pol Pot came to power, and he had converted all the classrooms to cells and torture chambers. Some of the cells had been left in the exact condition in which they were found in 1979. There were large photographs on the walls showing the bodies that were found in the specific cells. 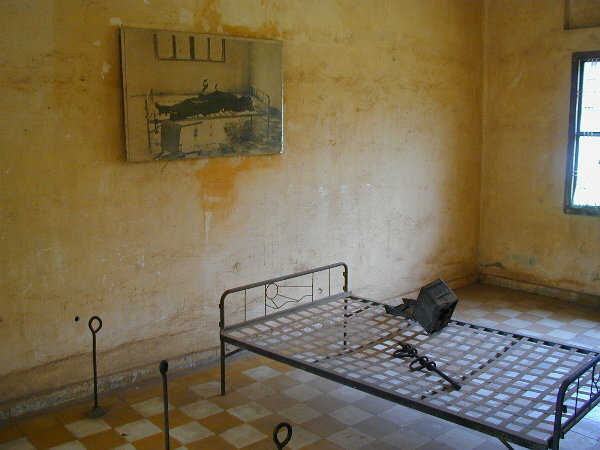 The torture chambers on the first floor each had only one victim but the victims were all mutilated and then killed on their beds as the Khmer Rouge fled the city, so the pictures were quite gruesome. Our guide, Bunley, was a young child living with his family in Phnom Penh, when the Khmer Rouge took over in 1975. His family, along with most of the other inhabitants, fled the city as Pol Pot entered, and traveled for six months with little food or work looking for places to hide. He later learned that his dad had been executed in a remote village as part of Pol Pot's genocide. It was pretty interesting to get the first person view of the times. After the S21 Museum, we went to see the most famous of the Killing Fields, Choeung Ek. Because of the many pictures we had seen, we had expected to see piles of bones spread across vast areas. However, those pictures were been taken at the time the area was excavated 1980, so now there were just pits showing the mass graves where the bones were found, as well as a monument filled with thousands of the skulls which were found in the graves. We thought a sign at the Killing Fields represented the Cambodian view of what Pol Pot had done: "They wanted to transform .... people into a group of persons without reason or a group who knew and understood nothing, who always bent their heads to carry out Angkor's orders blindly. They had educated and transformed young people and adolescents whose hearts are pure, gentle, and modest into odious executioners who dared to kill the innocent and even their own parents, relatives, or friends....They had burnt the market place, abolished the monetary system, eliminated books of rules and principles of national culture, destroyed schools, hospitals, pagodas, and beautiful monuments...."
While on the Palace on Wheels in India, we had heard from a friend that we could get access in Cambodia to pretty much any large weapons we wanted to shoot. When we were in Bangkok planning this trip, we asked about whether this was true, and the local guide said that we could look into it while we were there. Bunley, our Cambodian guide in Phnom Penh, said that there used to be three areas to shoot large weapons but the government had shut down all but one. We drove 30 minutes outside of town, asked directions several times, and ended up at a shooting range with many people/spectators standing around. We got out of the car a man approached us and directed us to sit. He then brought us a 'menu' of weapons listing the options and cost. We were quite surprised at the high cost, but figured you only get this opportunity once. Of course we skipped over the common hand guns and rifles that we have access to the United States. 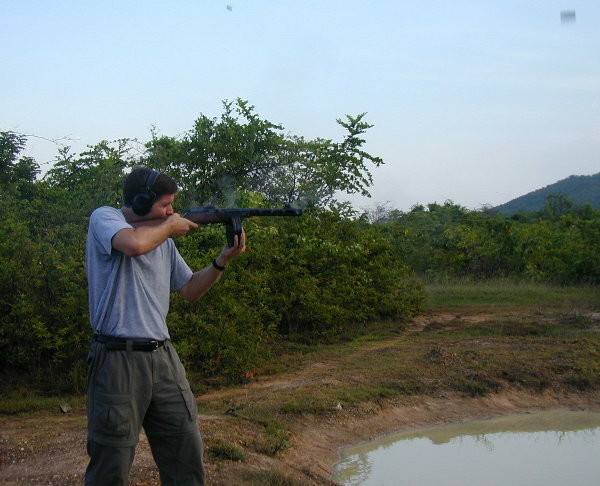 We viewed the large weapon options, and from the many fully automatic weapons and rocket launchers, we chose to shoot a K50 fully automatic Tommy Gun, an M60 fully automatic large caliber rifle that you have shoot with a tripod, a rocket launcher/bazooka, and to throw some hand grenades. We negotiated a price a bit lower than what they wanted (of course, it still cost 1,400,000 riel!) and then learned that we had to travel to a different range to shoot the larger weapons. We were told that it was only 20 minutes away as they filled the trunk with the small arsenal. After 50 minutes of driving, we (along with 5 men who "work" at the range) arrived in the middle of nowhere, and began our experience. The men first set up a target 100 yards away in the bushes and then loaded the M50 on the ground. We took turns laying on the ground and shooting the fully automatic rifle. A simple pull of the trigger would rattle off 10 bullets with a flurry! It was quite hard to tell if we were hitting the target since it was so far away, but the thrill was awesome. The 150 rounds we paid for went very quickly. Next, Dan shot the Tommy Gun at the next target, and the 30 rounds we paid for went in a single pull of the trigger! From the 50-75 holes in the target, we felt like we did pretty well, given how much the gun moves in the fury of firing. Next, we moved to another area of the field, where one of the men had set up a target on some trees 150 yards away. They gave Dan the rocket and bazooka and explained how to shoot it. They helped with targeting for such a distance, but then let Dan go at it. As he pulled the trigger, a huge rush of sound and air with the rocket swept past his face. 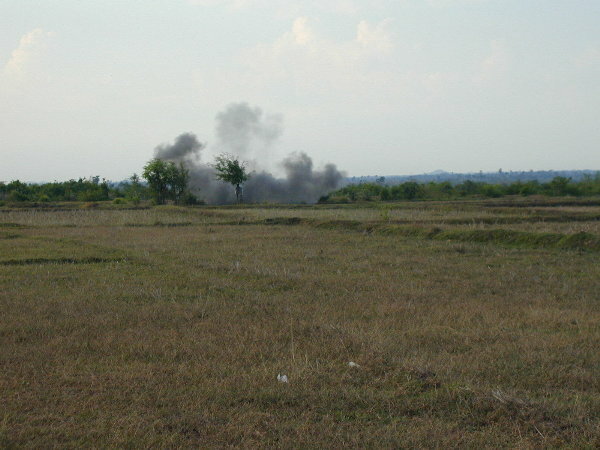 Then the smoke from the rocket engulfed him and clouded him in front and behind. As he looked up over the smoke he saw the explosion 170 yards off. Unfortunately, he missed the target, but the sound and site of the explosion was very cool. The whole experience was exactly as you see in the movies, but with more smoke, and more adrenaline. Next, Kristen walked with the range guides to throw a hand grenade. We were quite disappointed that they would not let Dan go with them to capture it on camera -- they said it was not safe to be near the explosion. Unfortunately, after practicing the throwing technique, Kristen threw the grenade and it popped like a firecracker, but did not explode. It was a dud! To make up for the dud, they offered to let us throw some "practice" grenades back at the other range, but at that point we were done with the long drives! After our one very-full day in Phnom Penh, we flew to Siem Reap to see Angkor Wat. We had two days to stay in Siem Reap, and saw the famous Angkor Wat and tons of other temples. According to our guide, the town entertained 500,000 tourists last year, almost half of all tourists that visited Cambodia. Although the town still looks like a very small remote town, there are a few large hotels, and even a StarMart (gas station/quick mart). In and around Siem Reap, there are hundreds of temples built from 800-1300 AD during the Angkor era. Many of the temples are in ruins, some are restored, and some are still in good shape. We were amazed at the lack of restrictions on access to the temples -- tourists are allowed to climb all over any part of the structures if they wish. According to our guide, all the temples were built by 'volunteers', no slaves -- when pressed about how the required skilled workers could 'volunteer' the many years required and still survive, our guide suggested that the king would support them. The most famous attraction is the temple of Angkor Wat, a huge set of structures surrounded by a large 100 foot -wide moat, creating a large island The large outer stone gate, which is accessible across the stone causeway over the moat, surrounds the vast inner land of fields and trees. Once through the gate, you can see the temples of Angkor Wat. The stone path continues across a thousand feet of fields, past two partially restored stone structures that are believed to be libraries, past two small ponds, to the outer temple. The outer temple is more of a covered corridor hundreds of feel long on each side of the square. On the entire length of the stone wall are very detailed bas-relief carvings, depicting religious stories and battle scenes from the period. 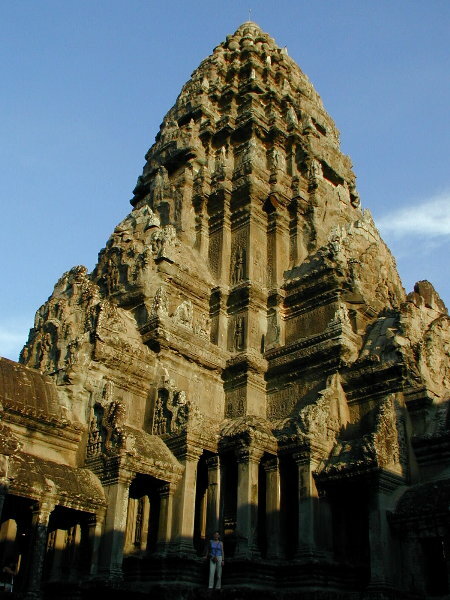 Because Angkor Wat was built over a 37 year period, different parts of the carvings represent different time periods. Our guide insisted on walking down two entire corridors and explain the stories represented in the carvings. We mostly just smiled and nodded, not understanding much of his narrative. (see Language Barrier below). From the corridor, we entered a smaller open stone area, in which stood another huge stone temple. We climbed (quite literally) the very steep stairs to enter the temple. Of course, there were more carvings and and statues, although many of the statues had been defaced or stolen. After entering another large open area, we climbed another even steeper set of stairs to the top most temple. From this vantage point, we had a great view over the front gate area of Angkor Wat. We were impressed that they had built the three levels of the enormous stone structures to such a great height. On leaving Angkor Wat, we could see an amazing sunset through the trees along the side of the road. Because we planned to watch the sunset from a temple on the hill (most of Siem Reap is very flat), we did not bother trying to take any pictures. 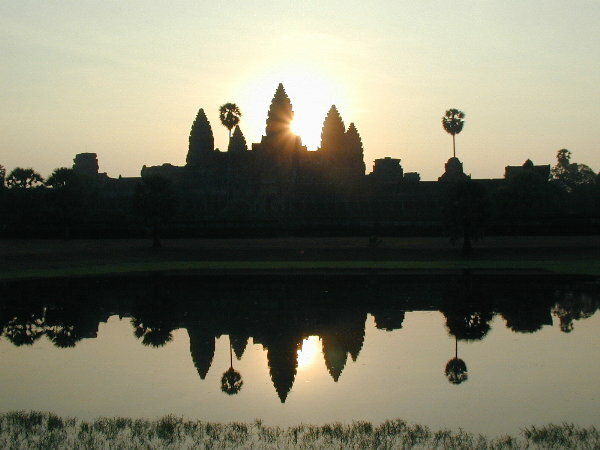 The next morning, we went back to Angkor Wat to see the sunrise from behind the towers of the temple. Hundreds of tourists gathered inside the outer gate and waited for the sunrise. Because we were entering the rainy season, much of the early sunrise was hidden behind the clouds on the horizon. Also to our misfortune, our view of any sunset the next night was also hidden by the clouds. Over the rest of the first and the entire second day, we went to many less-significant temples. Partially because many of the temples were in ruins, looked very similar, and our inability to understand the explanations by our guide, and partially because of the state of our interest level at this point in our trip, we did not appreciate the many temples. Just for the record, the sites we visited included the ancient city of Angkor Thom, within which are located the temples of Bayon and Baphuon, the elephant terrace, royal palace, Banteay Kdei, Lolei, Preah Ko, Phnom Bakheng, Preah Khan, and Ta Phrom. 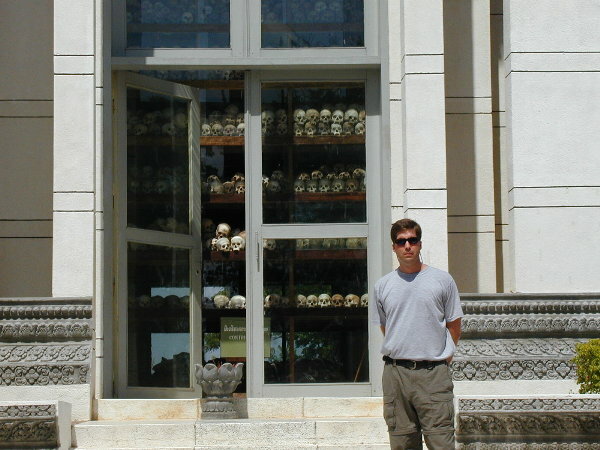 The skulls at the monument at Choeung Ek, the killing fields, in Phnom Penh. Dan in front of the monument at Choeung Ek, the killing fields, where they believe 20,000 people were killed by the Khmer Rouge in 1975-79. 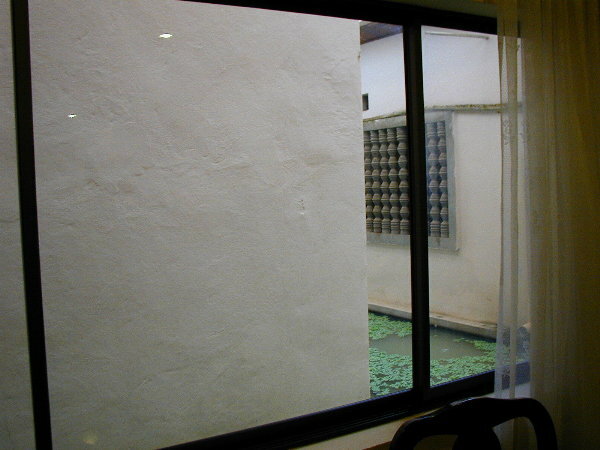 One of the cells in the Pol Pot's Khmer Rouge Security Prison 21 (S21), now a Museum in Phnom Penh. Pol Pot's forces tortured people here before taking them to the killing fields. One of the many disturbing paintings in the S21 Museum. 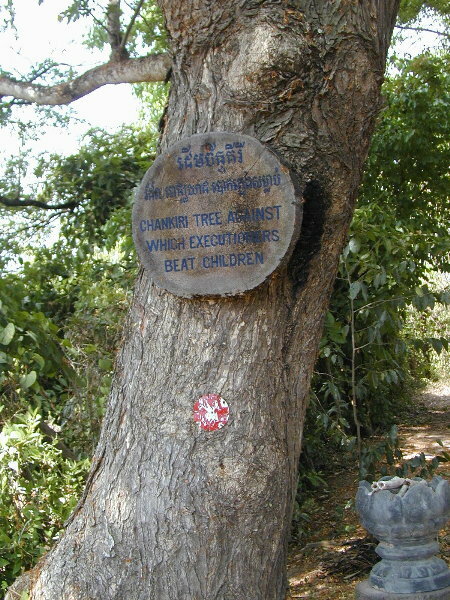 This one shows the Khmer Rouge executioner throwing a baby against a tree. 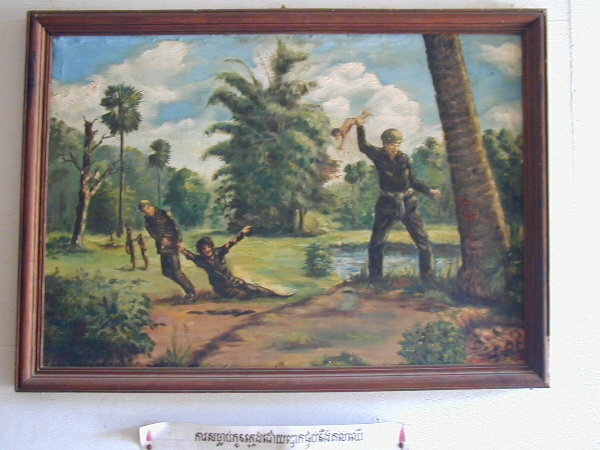 And then the tree in the killing fields represented in the painting above. 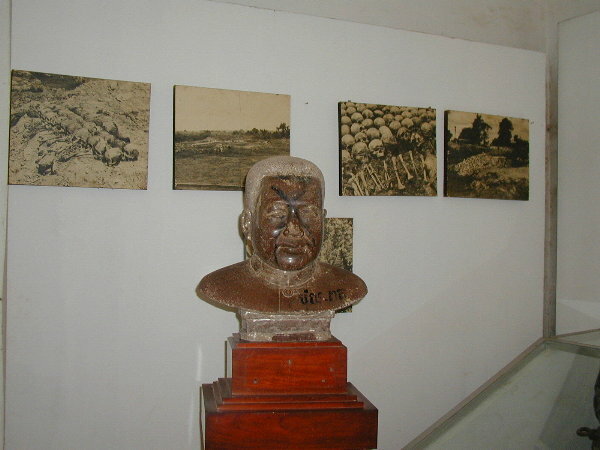 A sculpture of Pol Pot, the leader of the Khmer Rouge, who took over Cambodia 1975-79 and killed 1-2 million people. 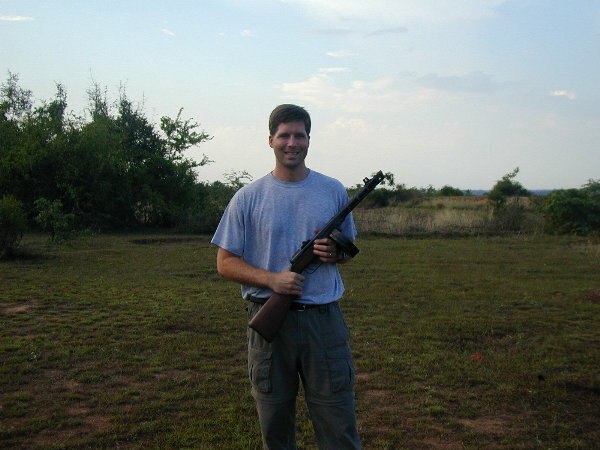 Dan holding the K50 automatic 'Tommy Gun' in a field outside Phnom Penh. Dan shooting a quick 30 round magazine on one pull of the trigger. Notice the smoke on the gun, and the shells flying in the picture. 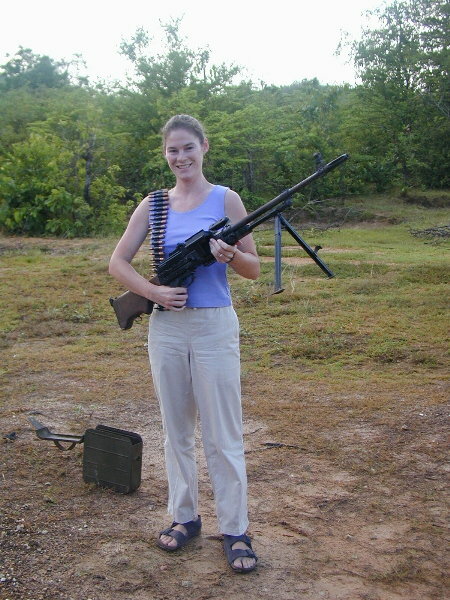 Kristen holding the M60 automatic machine gun we shot in the field. Dan with the M60. We shot it lying on the ground, aiming at a target nearly 100 yards away. The massive gun was quite amazing to shoot. Kristen shooting the M60. Notice the spent shells in the air on the left of the rifle. 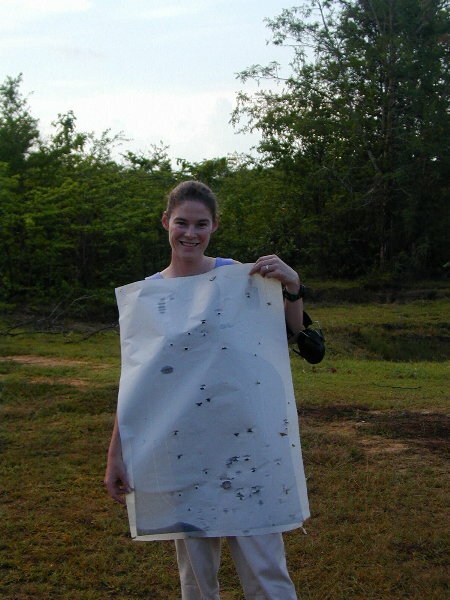 Kristen holding the target with the holes from our K50 and M60 shooting. Although we shot around 160 rounds and there are not 160 holes in this target, the target was quite far way, so we feel that we did ok.
Kristen holding the hand grenade she threw (once they moved her safely across the field). 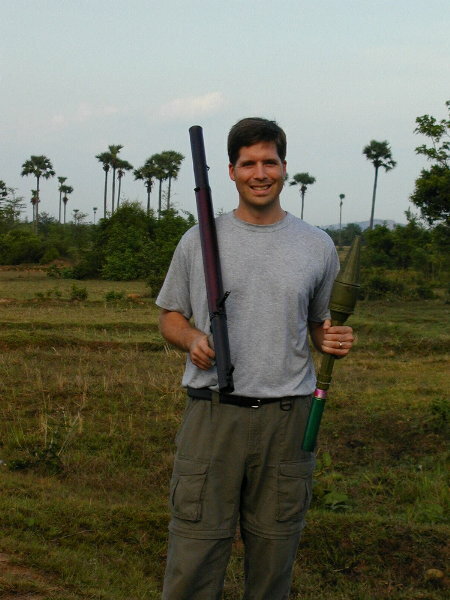 Dan holding the bazooka (rocket launcher) and rocket. The actual gun is so simple it is unreal. Dan about to shoot a bazooka (rocket launcher). It was just like you see in the movies -- a huge rush as the rocket leaves the gun and the enormous cloud of smoke engulfed him. The rocket exploding near the target on the trees over 150 yards away. Maybe Dan did not hit the target, but we are quite sure the target was scared. 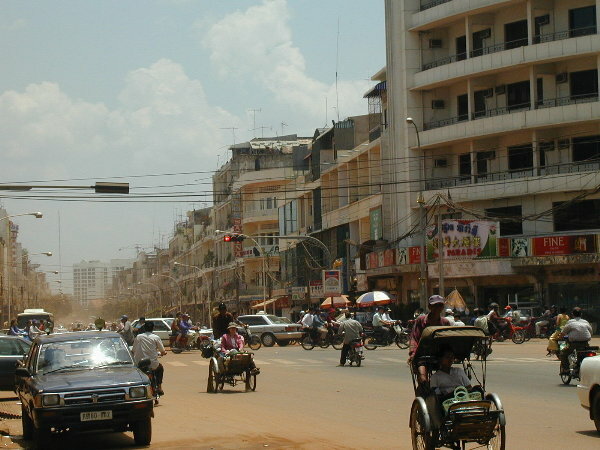 Street view in Phnom Penh. 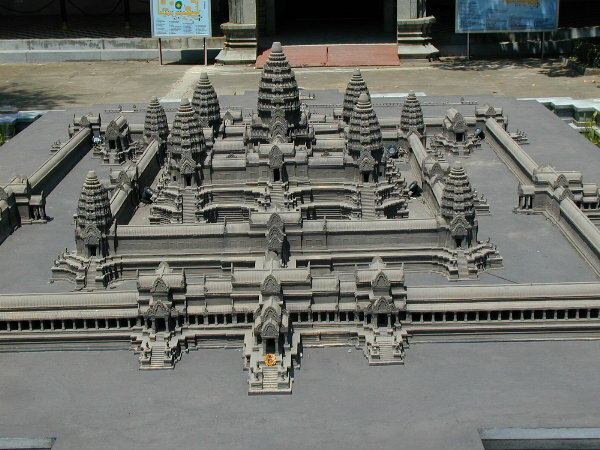 Scaled down model of Angkor Wat, in the Silver Pagoda in Phnom Penh. This was a good representation of what were to see in Siem Reap. We are standing inside the outer gate of Angkor Wat with its main temple structure in the background. 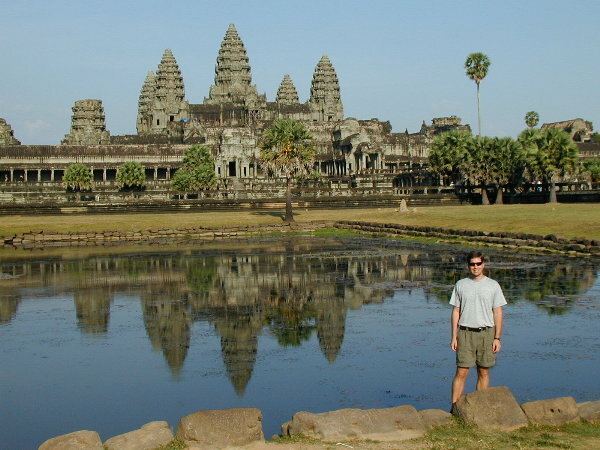 Dan next to one of the lakes with Angkor Wat temple in the background. Around the entire huge base of the Angkor Wat temple, the long corridors held stone carvings telling stories about the time period. Kristen enduring the details of the carving stories. 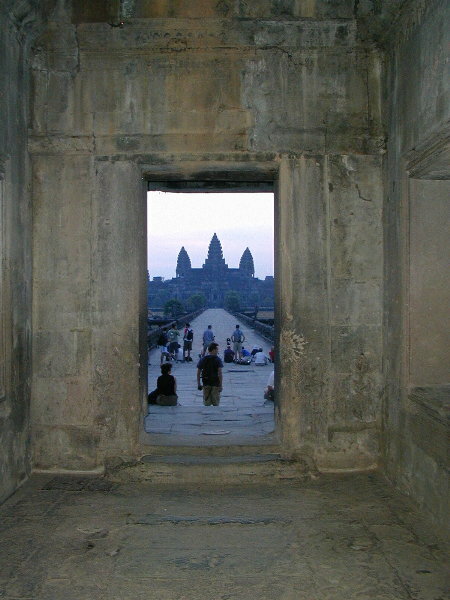 A view of Angkor Wat temple through the door of the outer gate. 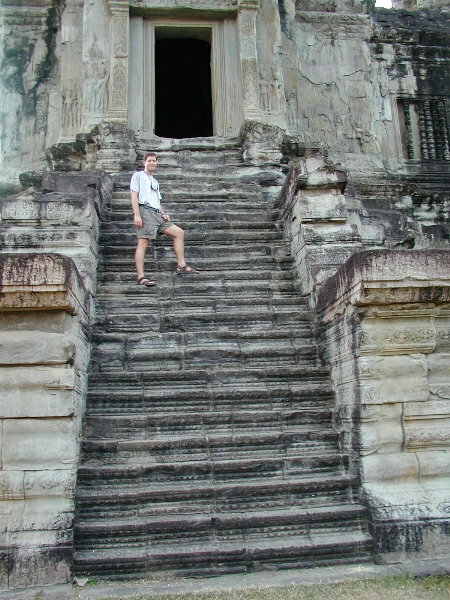 Dan climbing the very steep (80°) stairs leading to the second level of temples in Angkor Wat. 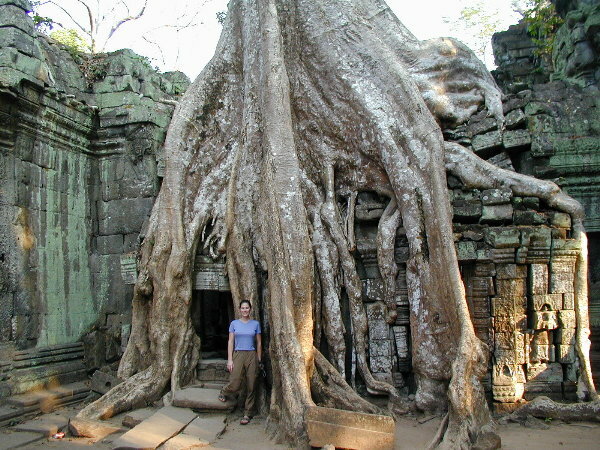 Kristen at the base of the center and tallest temple, on the third level of Angkor Wat. Sunrise view over Angkor Wat, from inside the outer gate. Panoramic sunrise view over Angkor Wat, from outside the outer gate. 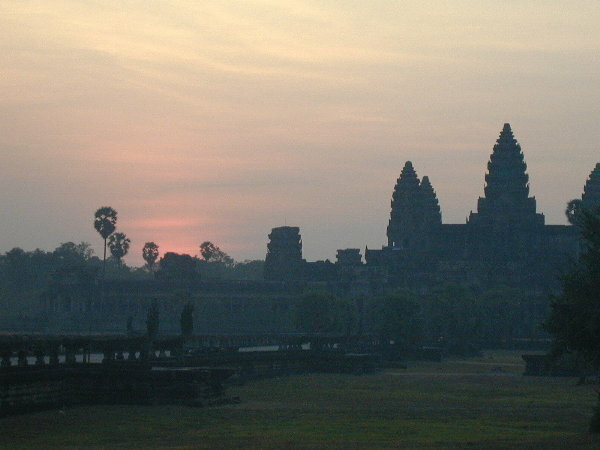 Sunset over Angkor Wat. Taken from inside the outer gate, near one of the lakes. 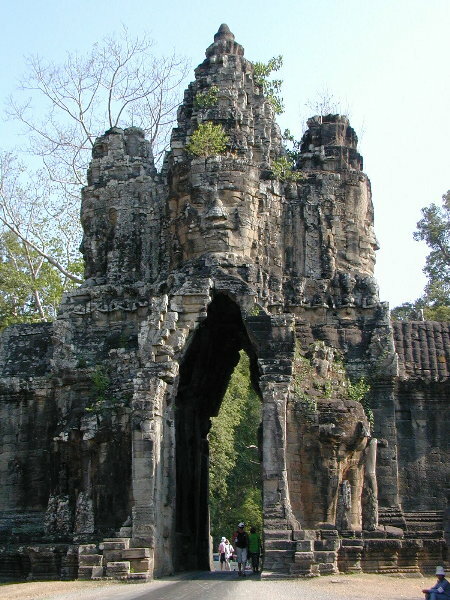 One of the gates of Angkor Thom, a huge walled city in which many temples remain. 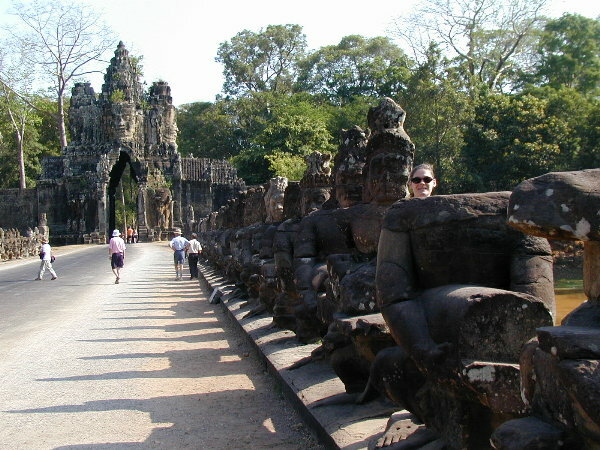 Kristen with the many demons and gods that line the causeway to the Angkor Thom gate. Many of the heads have been stolen. 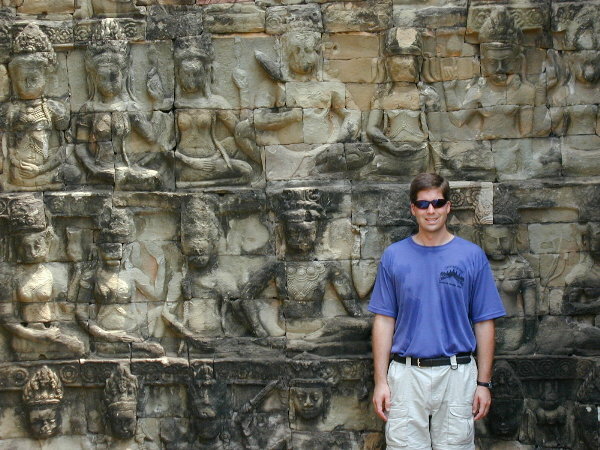 Dan in front of the carvings in front of the supposedly 5000 concubines of the Leper King, on the leper terrace in Angkor Thom. Kristen in front in Banteay Kdei, another temple. 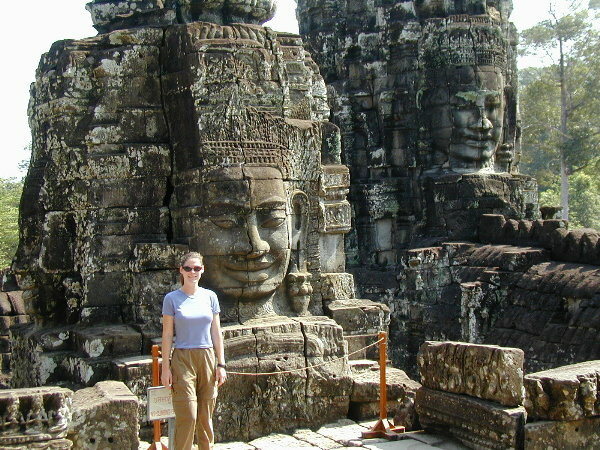 Kristen in front of Bayon, another temple. 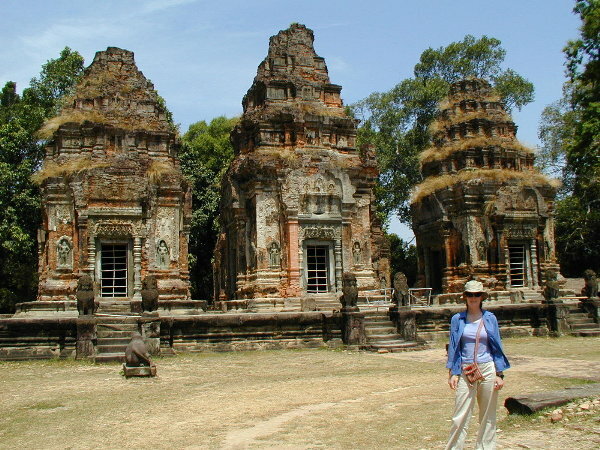 Kristen in front of Preah Ko, another temple. The last temple of the trip, Ta Phrom, which we almost skipped, was pretty cool. It was in ruins and overgrown with huge trees. Some of the trees were huge and covered entire walls. The view from our hotel room in Siem Reap. On this trip we got used to getting the worst rooms in the best hotels. Unsolicited, we found some interesting perceptions of the United States' historical relationship with Cambodia. As we drove a modern (one of the few) two-lane road outside of Phnom Penh, our guide told us 'it is the best road in Cambodia, and was built by the Americans 'when Cambodia was part of America'. We believe he was referring to the period in the early 1970's (just prior to Pol Pot's regime) where America had used Cambodia as a base in the Vietnam War. The Cambodian government had allowed us to bomb a major portion of their country where the Viet Cong were suspected to be hiding, and we upgraded some of their infrastructure to support our presence. In Siem Reap, our guide referred to a period when 'America invaded Cambodia', but not in an negative manner. Clearly, the view of the Cambodian/US history is not consistent. 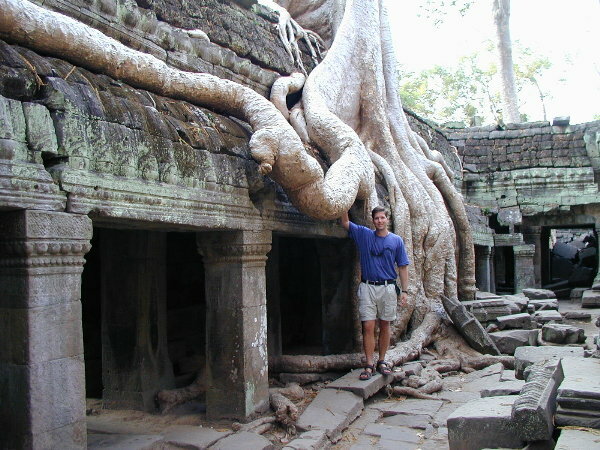 We struggled greatly to communicate with our guides in Cambodia and Vietnam. We estimate that we understood a little over half of what they said, which was mostly ok, because they typically went into more detail than we needed. We learned quickly that any leading questions or our own initiated conversation would be wasted effort, because they could not understand what we were asking and we could not understand their reply. We became quite proficient at every variation of politely acknowledging their statements: ok, uh-huh, ohhh, hmm, mmmm, interesting, I see, really, wow, etc. Given the state of, and apparent financial condition of the country, we found Cambodia to be relatively expensive. Hotels in which we stayed would be considered 3 star (maybe 4 star in Asian standards) listed rates of US$140-240 per night (we paid less via the tour). Entry fees to tourist areas cost as much as $20/day, and meals cost as much as US$10. Although these are in no way expensive by US standards, they are relatively expensive compared to what we have found in other parts of Southeast Asia. While in Bangkok, we found a pretty good Asia travels website for a discount travel company for which we had also found other advertisements, so we visited their office. In a matter of an hour, we decided on a short but full itinerary through Cambodia and Vietnam. They customized their packaged tours to do exactly what we wanted, so it worked out great. Over our week of touring the two countries, we flew from Bangkok to Phnom Penh, Cambodia, Phnom Penh to Siem Reap, Siem Reap to Ho Chi Minh City, Vietnam, Ho Chi Minh City to Danang and back, then back from Ho Chi Minh City to Bangkok. Lots of flying but they were all relatively short flights (~1 hour), many of the flights were quite empty, and our guides/drivers were always there waiting for us at the airports, so it was not too bad. Had no choice on this hotel, the 'deluxe' option on our tour. Decent restaurants and river view. Information Page (from Asia Discovery) Had no choice on this hotel, the 'deluxe' option on our tour. Not the greatest, but not sure what other options exist. 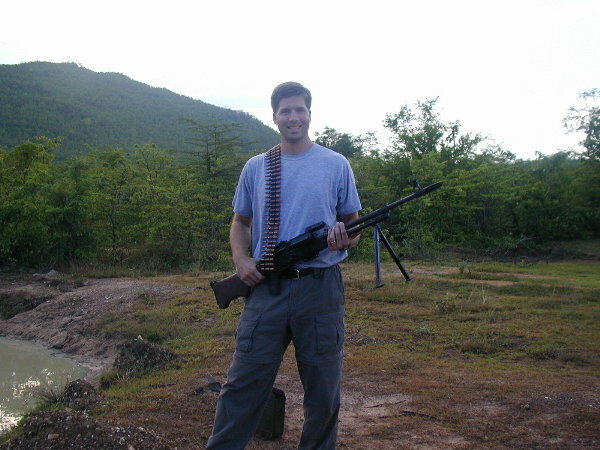 Telephone #: 012-937-395 Shooting range outside Phnon Penh, where we shot the large weapons. Not sure if the telephone # works, but guides should know how to find it.